I live about a mile from a Ferrari dealership. As I walked nearby it earlier this week, I saw a trailer parked around the corner with a low-slung sports car inside. 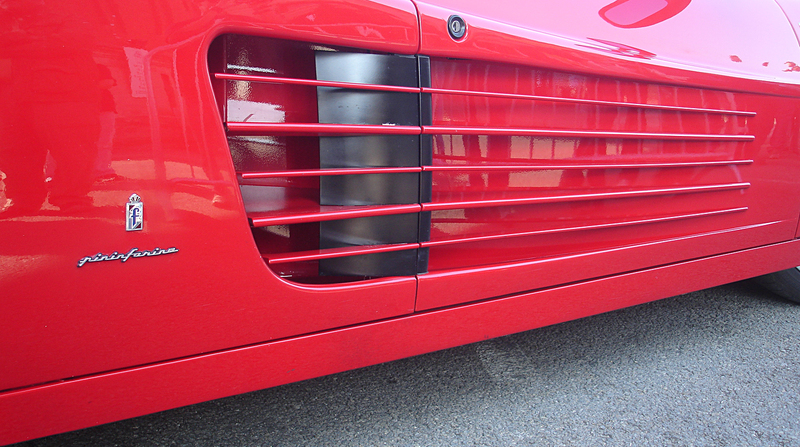 Getting a little closer showed that it was definitely a Berlinetta Boxer—possibly this one. “Now that’s a Ferrari!”, I said. The man unloading the car chuckled as I walked away. For 1983, Ferrari’s lovely Pinanfarina-designed Berlinetta Boxer 512i received few if any changes. The Boxer’s engine was Ferrari’s 340 bhp 4.9 liter flat 12 with Bosch K-Jetronic fuel injection – the BB512 had moved to fuel injection (and added the i) for the 1982 model year. When paired with the five-speed manual transmission, 0-60 came in about 5.5 seconds with a top speed of 170 mph or so—fast, fast, fast for 1983. Ferraris had gotten more luxurious: standard equipment on the BB512i included air conditioning (often said to be inadequate), leather seats, power mirrors, power windows, power door locks driven from the key, a Nardi steering wheel, and a Pioneer AM/FM stereo cassette deck with 7-band graphic equalizer. Although the Berlinetta Boxer was not legal in the U.S., some importers converted them to U.S. specifications with the addition of catalytic converters, side reflectors, and larger bumpers. Of course, there’s a fairly famous eighties music video associated with this car. Sammy Hagar may have his issues, but the Ferrari BB512i he drives in the video made for this song demonstrates exquisite taste. When interviewed by Motor Trend in 2008, he still owned it. According to Hagerty’s valuation tools, all the money for a 1983 Berlinetta Boxer 512i in #1 condition is $185,000 (though recent auction results may make that seem low). A more “normal” #3 condition example is valued at $122,000. Berlinetta Boxers seem to come up for auction more than as standard sales—Auctions America has 1984 BB512i on the docket for August. There’s some really excellent support for Berlinetta Boxers (and all Ferraris) from the folks on FerrariChat (who contributed to this post). Make mine Rosso Corsa (red), please, though I’m quite tempted by how they look in Grigio (grey).